Back in Eleuthera from travels in the UK…. So here I am , happy to be back home in Eleuthera after my travels in the UK. I have always needed to take a little time away on my own to recharge my batteries and nurture my spirit so I try, once a year, to take a trip to the UK to catch up with my girlfriends, sisters and other family. I have never done this in February before but armed with my big fake fur coat, gloves and lots of warm sweaters off I went. Me with granddaughter Alba and an anatomically correct boy doll !! The flight from Nassau to London is overnight – the plane takes off at about 10pm so I always go for a nice meal beforehand – this time it was to Mahogany House at Lyford Cay. There is no way I can wait until 11pm to eat dinner on the plane so this treat beforehand means I can take half a sleeping pill when I get on the plane and then try and catch a few hours sleep. The flight is about 9 hours – a long time when you are twitching and fidgeting in those less than luxurious seats !!! I did plenty of shopping in London and then lots of essential things like having a make-up lesson and getting my eyebrows threaded – don’t ask if you don’t know ! You may have read my blog last week about the great day my friend Jane and I had at the Raymond Blanc Cookery School – after that I drove on up to Northamptonshire to visit both of my sisters and have a good catch up with them. I stayed in a tiny one bedroomed cottage in the village of Farthingstone – and I was so grateful that the owner was very kind and kept the heating turned up high – deliciously warm and cosy. Temperatures were between 30 – 40 degrees F – VERY cold to me after not experiencing a proper winter for 10 years …. It was reassuring to see snowdrops out in flower – always promising that Spring is not that far away. I had some lovely time catching up with my friend Joy Agius – she made all my curtains and blinds when I did interior design back in the UK – and had made me some lovely curtains for our new extension. Plus she repaired a favorite cardigan which had been eaten by a mouse ! – why does it always have to be your most treasured garments that get attacked – I don’t understand it …. The luxury of having time and the opportunity to be with old friends and catch up, laugh about the past and talk about plans for the future – face to face – is very precious to me, living as we do so far away from where they are. Skype is a great invention, but nothing beats being in each others actual company. Living on island as we do, means that you learn to treasure the times you can share together, and if it involves eating together – so much the better. While I was away I managed to eat a great curry with friends Jane and David in Oxford. Chinese takeaway with my sister Jane and nephew Sam. 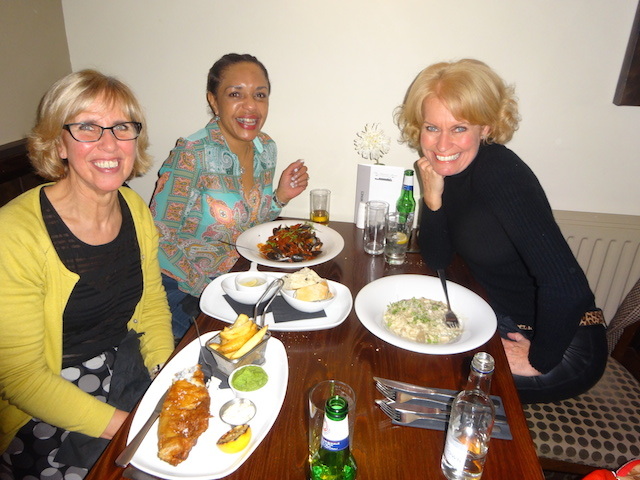 Fabulous traditional English pub grub – chicken and leek pie pie with my other sister Anne and her husband Bob. A couple of meals of fish and chips – heaven !! French onion soup at the Brasserie in Chelsea after a mooch around The Conran Shop – one of THE most beautiful design and furniture shops and a couple of great meals in Carluccio’s – a great Italian chain of restaurants – with Bob’s daughter Sami and her husband Billy. French Onion Soup on cold day – heaven ! Oh and a trip to the cinema to see 50 Shades of Grey !!!!!! Yes – I remember traffic jams ! Flying back from Heathrow airport on a sunny day was a great way to finish this trip – the English countryside looked glorious and the icing on the cake was managing to get on a delayed flight to North Eleuthera through Pineapple Air so that I didn’t have to spend the night in Nassau. Back in my own bed – there really is no place like home….